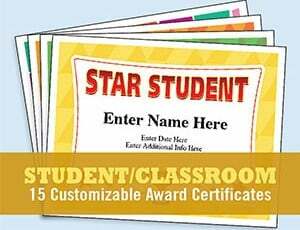 A collection of Student Certificates Templates to recognize kids and to help them build their sense of accomplishment. Happy Birthday certificates, Remarkable Reader awards, diplomas and more. We especially like You’re an All-Star, Star Student and You’re Awesome certificates. For each certificate, you can type in the text fields to customize it to the recipient. Add things like name, date, teacher’s name, words of praise, bullet points, etc. It’s simple to do and in no time you’ll have a very professional-looking award certificate. Use these templates year after year, with class after class.